Any good writer will have shelves and shelves of books that they don't know what to do with or can't bear to part from (or at least a well-used library card). 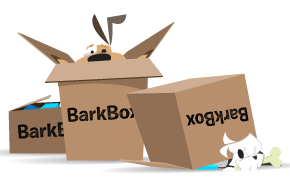 If donating or selling your used books is not an option for you, you've got to have a place to put them. And who doesn't like a wall full of books, especially when they look like this? While I like regular rectangle bookcases as much as the next person here are some other shelves that bring form to function. 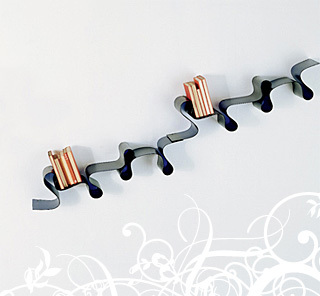 This ironic shelf would be perfect for a child's room, or even an eclectic adult space. I absolutely love everything about it; the lines, the idea, the shape, the function... it's perfect. The Bibliochaise: This “book chair" simply integrates a series of bookshelves around a place to sit, making it perhaps the perfect reading chair. 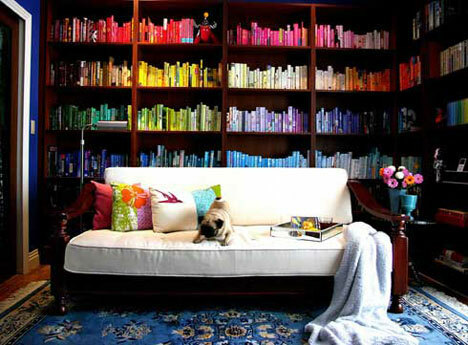 The shelves come in a variety of colors, as do the cushions. You even have the option of upgrading to leather cushions if you feel a splurge coming on. Another take on the book chair idea, the Bookinist by Nils Holger Moormann. I like the built in light and the wheel for easy maneuvering. It also looks like the seat back might fold down to create a table when not in use. Because you can't have too many tables. This Rolling Shelf idea is pretty nifty. The shelf rolls up to allow for a tall object and then rolls back down flat when you decide you want to move the object, or, if like me, you kill you cacti. This unique bookshelf expands when you get more books (Christmas? Birthdays? Book launches?) yet still has that element of style built right in. Plus, with the varying sizes of shelves, there is no wasted space for short and tall books. DVD's, CD's and other media could also be stored in the cubbies, providing a complete entertainment media storehouse. 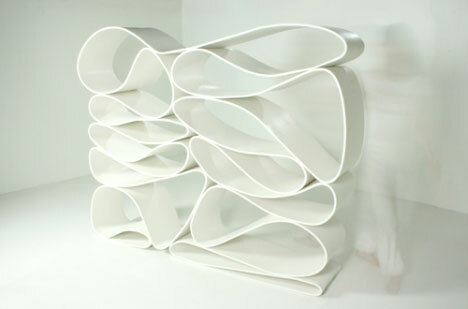 The REK was created by Rotterdam-based designer Reinier de Jong. 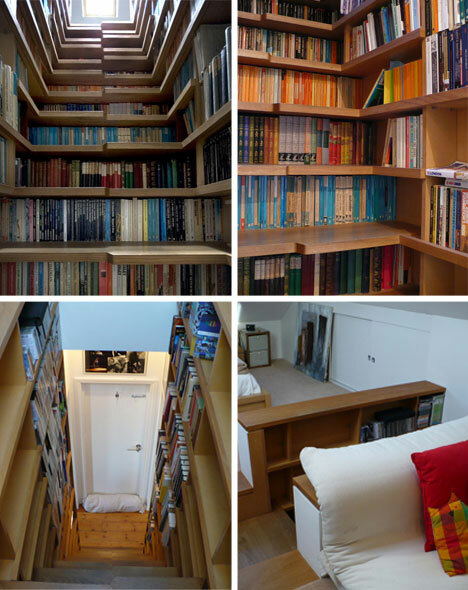 There's a flat in London with a bookshelf with a built-in staircase that is simply stunning, if not a bit dizzying and hard to keep dust-free, especially so close to an outside door. 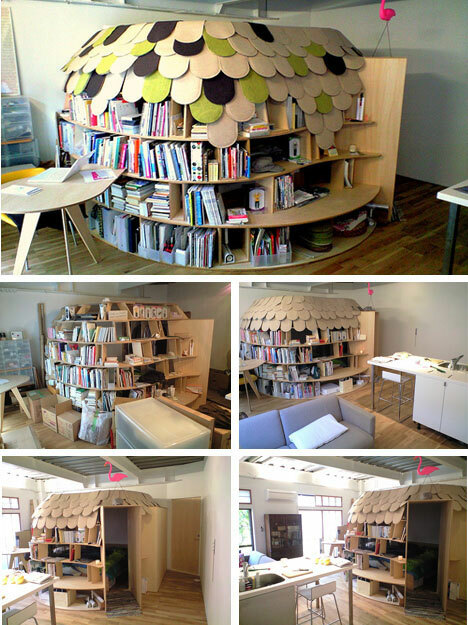 How awesome is this bookcase bedroomDesigned by Point Architects in Tokyo?! If I had a bigger room, I'd totally want one! But I like holes and dark places. (That's what she said). the more avant garde side of us might like the Lovely Rita. Made in Italy by Kartell, this Lovely Rita Bookshelf ($285 USD) is available in four translucent color options, and adds an elegant and sophisticated accent to your living room, bedroom, or study. While not very functional for large amounts of books, the Neverending Bookcase is really pretty. I think I'd spend hours and hours just staring at it and pondering life's questions. Maybe you've only got a few books, but still want to display them in a creative way? 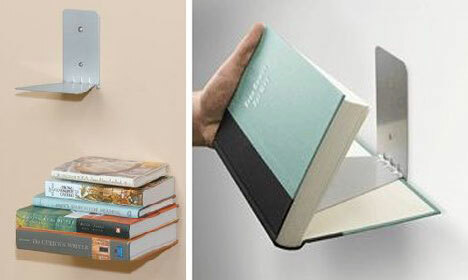 How about the Floating Book Shelf then? The bottom book hooks onto the shelf using a clever little lip on the underside and then the rest of the books just stack on top! For about 10$ on Amazon, it's a steal. Speaking of steals, how about bookcases that do double-duty? Using the bookcase coffin, you can have your books and... uh... be buried in the case, too. With the doom and gloom surround paper books these days (and the supposed AWESOMES! surrounding ebooks) this seems a bit too literal and ironic. Plus it's not pretty. And I want to be cremated. The books all look waaaay too organised in that first picture...and probably fake. Who colour codes their bookcase? If someone uses books in that way to decorate their home then they're clearly just using them as decoration as not as entertainment, which is very wrong in my opinion. I want a library in my toilet when I get my own place. Just a walls and walls of books. Very convenient. Umm.. I do! Well, i've only got about 30 books so they're not really as colour-coordinated as that shelf, but if I had tons, this is absolutely what i'd do with them! You know that when you flush the toilet, bits of 'stuff' fly up in the air from the rushing water? I don't want my books anywhere near that. This is why i'm so stubborn about keeping my toothbrush covered, if not placed away and I will never set it down on any surface or I have to throw it out. I want the book chair and the book staircase! Aren't they great? Thanks for the great ideas!